Subspecies: A population of a species occupying a particular geographic area, or less commonly, a distinct habitat, capable of interbreeding with other populations of the same species. Visiting the Ghosts of Lake Lahontan. 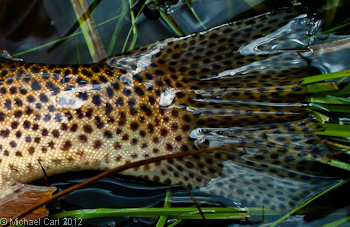 Cutthroat trout are usually recognized by numerous black body spots and yellow to red slashes of pigment under each side of the lower jar (See the photogragh below for the signature red slash). Lahontan cutthroat tend to be dark olive to reddish yellow and the spots are larger and fewer - as evident in the photo above. Pauite cutthroat trout have coppery, greenish, or yellowish bodies. 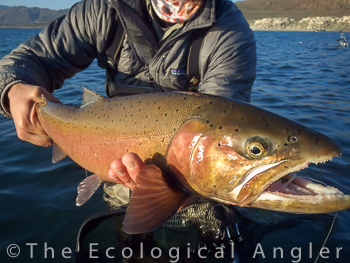 Cutthroat trout in general have larger mouths and more slender bodies than rainbow trout. Stream resident cutthroat trout may live their entire life in less than 20 meters of stream. 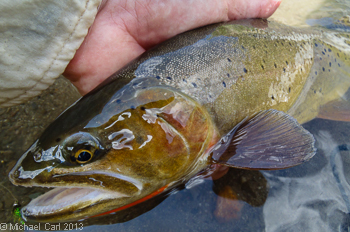 River resident cutthroat, however, move with flows and availability of food. In lakes, cutthroat trout roam over a wide range and will travel extensive distance to spawn in upstream tributaries. Cutthroat trout in Pyramid Lake traveled 160 km upstream via the Truckee River into Lake Tahoe to ultimately spawn in tributaries to the lake as well as the Truckee River. Similar to other trout, stream resident cutthroat trout feed primarily on the drift - consuming a mix of terrestrial and aquatic insects. Cutthroat trout are opportunistic feeders, so whatever happens to be most abundant in the drift will be the most abundant in their bellies. Lake dwelling cutthroat trout feed on insects taken at the water's surface or zooplankton. 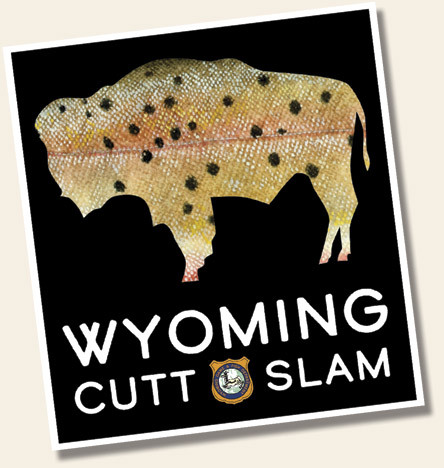 However, if neither is available cutthroat trout will feed on insect larvae, crustaceans, and snails off the bottom. Coastal cutthroat trout,Oncorhynchus clarkii clarkii, reside in the coastal streams of North America from the Eel River in northern California to south central Alaska. These native trout prefer small coastal streams, rivers, and lakes and are closely associated with the temperate rain forests of the Pacific Northwest. Of all the subspecies of cutthroat trout in North America, they are the only one's with an anadromouslife history. They exhibit complex life history that includes resident, river migrant, lake migrant, and marine migrant forms. Coastal cutts, sometimes referred to as “sea-runs” can be found in the estuaries and lagoon systems of northern California. Coastal cutthroat trout spawn in small headwater streams, typically above the spawning grounds of other Pacific salmon.